BoardGaming.com> Games> Card Games> Superfight! Can a Pope who shoots lightning (but can't see) defeat a chimp who throws grenades (but is handcuffed to a golf cart)? YOU DECIDE! SUPERFIGHT is a new card game that is all about losing your friends over hilarious arguments over ridiculous fights. Check out the publisher overview video in the videos tab above that explains the concept. As you can imagine, the resulting discussions are amazing. The core game is pretty neutral in terms of content, meaning most people will recognize most cards. Best played with groups, this game is all about choosing a hero and an attribute and then throwing an extra random attribute on there for good measure. From there you need to explain why your character would win in a battle over another character, and if you make it around the table you get a point. Hilarity almost always ensues, as the situations and reasoning for why a particular character would win tends to get very in depth and ridiculous. As an example, let’s say the character someone plays is Barney with acid blood…*flips new card* …and he has a hostage. Barney did pretty well until someone drew Darth Vader with the power to control his opponents right arm. Controlling his right arm Barney was forced to release the hostage and then Darth Vader merely force choked Barney rendering his acid blood harmless. The other players not participating make the deciding vote, so players can say whatever they like during the argument. But they want to make it compelling and realistic, so that the voters will side with them once the dust settles. Reminiscent of Cards Against Humanity, but a great deal more fun with more replayability imo. It’s a great game for those who like to do something without a lot of prep work and who like to think outside the box with a lot of things. House rules are great and encouraged, and there’s never a penalty for not knowing something since you can always pick another card. Pulling this out while waiting for dinner to cook (or let’s be honest – the pizza to show up) and arguing over whether Jason with Laser eyes and a unicycle for legs beats Doc Oc with chainsaw hands and an army of poodles is… I don’t know. It’s something else. It’s bizarre. But it’s something that you don’t really know you want to do until you’re in the middle of doing it and suddenly you really wish that he had the rocket skates because Jason can get away faster from the poodles than you thought. There’s definitely an edge from people who were rules lawyers in their D&D groups, or actual lawyers in real life, or teachers probably. But you really do hone debate skills and learn how to think of things from other perspectives. We’ve gotten a couple expansions from nerd things and loot crate so adding things like locations (In a volcano! Falling through the void! Inside the Tarrasque! On the moon!) gives you more things to argue from since poodles need oxygen on the moon and laser eyes if you miss will definitely probably puncture the stomach of a Tarrasque and things like that. Fun game. Much discussion. So argument. Wow. 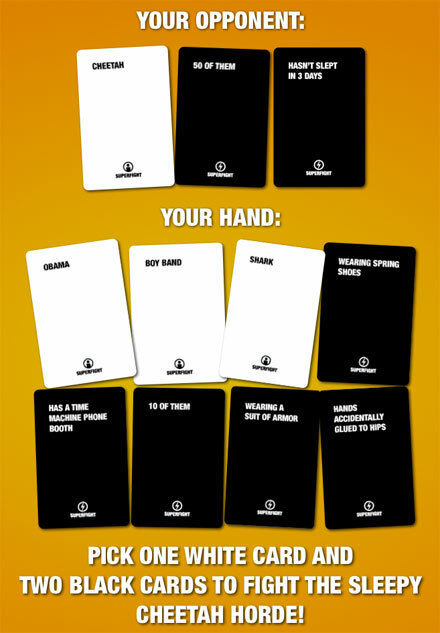 I very much enjoy Superfight! I got it on a whim after finding it on Amazon by a recommendation. I bought the game and most of the available expansion packs. The game is a subjective game of pitting random enemies with random enhancements against your enemies with your chosen enhancements against each other to see who will win. It’s an easy game to pick up and play, and easy game to modify to make a little more interesting, and the expansion packs can add some new situations to your game. This is the stupidest game i have ever seen. There’s no strategy. The scoring is completely subjective. They say the fun is supposed to be in arguing with friends about the ridiculous imaginary fights. But there is a fine line between ridiculous and moronic. And this game crosses waaaaay over into the moronic territory. If your friends are 12 yrs old and think fart jokes are hilarious, then you should be fine. Everyone else should avoid this game. Add a Review for "Superfight!"